From time to time, it is possible that there will be stock translations that are unsuitable for your business needs. When such instances occur, you can enable the showing translation keys feature, record the key name, and then update the translation with your own custom translation using the Translations feature located in the Admin application. In SAP Field Service Management applications, an account can have multiple companies. Please note that custom translations are company-specific. This means that these custom translations will only be applied to the company on which they have been set. 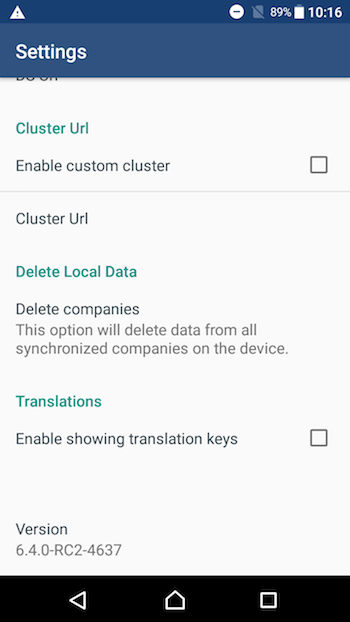 The first step is to enable the showing translation keys feature from the app settings to view the key name of the translation you wish to replace. Next, you will need to create a custom, company-specific translation for the key/s using the Translations tab located in the Admin application. After successfully creating a custom translation for the key/s, you can then synchronize the changes to the mobile application. Please note that this example was created using the Android client. When completed, you can then disable the feature again from the settings menu. ATTENTION: To complete this step you must have ADMIN privileges. Using the Translations feature in the Admin application, you can then update existing values with custom values by referencing the Key displayed using the Enable showing translation keys feature. Login into the Admin application, select the company for which you wish to create a custom translation, and select the Translations tab. 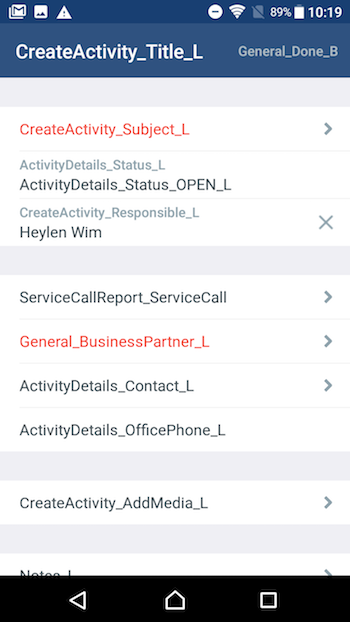 Select the mobile client from the Clients dropdown. Please note that key names are different in each mobile application. Select the language for which you are creating a custom translation. Enter the Key found using the Show Keys feature for which you wish to create a custom translation. Enter the new value for the key. The custom translation will now be visible in the Translations view. The custom translation will then be visible in the mobile application.